X-Men: Red Average 4.74/5 - out of 69 total votes. THE FIRST SENSATIONAL ARC OF AN ALL-NEW TEAM OF X-MEN STARTS HERE! 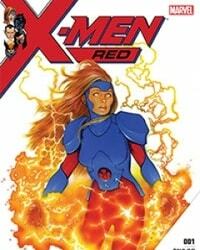 JEAN GREY is back! Returned to a world she doesn't recognize, the First Lady of the X-MEN gathers an unlikely team — NIGHTCRAWLER, NAMOR and LAURA KINNEY (A.K.A. ALL-NEW WOLVERINE) — to face an evil that threatens to tear down XAVIER's dream by any means necessary!